Board Member Benjie Arcamo and Vice Mayor Pedro Fuertes have agreed to join forces and run as mayor and vice mayor of Panglao, respectively, in an alliance forged to put up a unified stand against incumbent Mayor Leonila Montero who is seeking reelection. 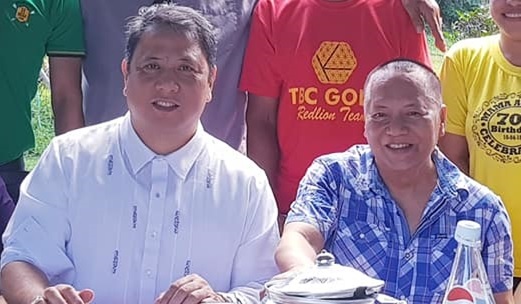 Arcamo on Friday told dyRD Balita that he met with Fuertes in Tagbilaran City to formalize the alliance in the presence of his Padayon Bol-anon coalition allies third district Rep. Arthur Yap, first district Rep. Rene Relampagos and Governor Edgar Chatto. “Digto sa balay ni Congressman Relampagos sa Cogon, nangadto mi ni Vice Mayor Pedro Fuertes, ako ug ang akong mga kaubang konsehal ug mga supporters, amo nang gi-selyohan ang among paghini-usa,” said Arcamo. Arthur Arboladora, Arcamo’s initial vice-mayoral bet, officially announced the withdrawal of his candidacy shortly after the alliance with Fuertes was sealed. However, Arcamo noted that his original slate for the town’s Sangguniang Bayan will remain intact. “Nagpabilin atong mga konsehal, way kausaban. Ang pito ka konsehal NUP [National Unity Party], ang usa Akbayan,” he added. According to Arcamo, former Panglao mayor Doloreich Dumaluan, a perceived supporter of Fuertes’ candidacy, was informed of the alliance. “Sa akong nadunggan gikan ni Vice Mayor Fuertes ug iyang mga kauban, nahibaw g’yud ang kanhi mayor Dumaluan,” he said. Dumaluan has yet to issue a statement regarding the development but he had earlier made public his efforts to unify political contenders in Panglao into one ticket.